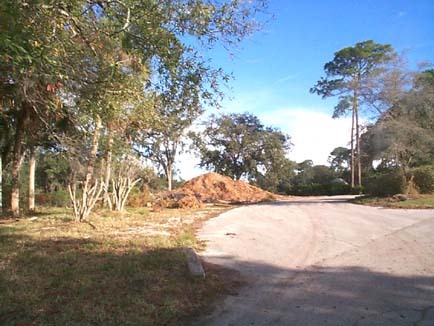 The picture above shows the first Child's and Neighborhood Park within Country Club Cove Subdivision of Palm Coast. It is one of the items the Prospective Buyers would see in their 'Guided Tour' of this first Neighborhood of Palm Coast. 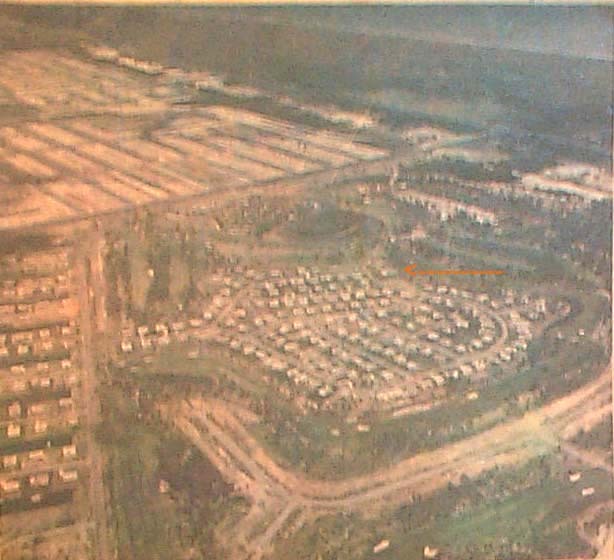 The Orange Arrow above shows the Parks Location directly. This Park most probably was called Country Club Cove Park or the Palm Harbor Park. Some of our friends and neighbors refer to it now as Ashleys Park. Ashley , the fouth generation Pioneer Family, wanted to go to the Park with her Great Grandmother. Ashleys' Great Grandmothers wheelchair got stuck in the sand and when Ashley got there, it was in disrepair. Three Generations of Palm Coast Pioneers Family used this Park; Ashley,the first fourth Generation Palm Coaster Pioneer, can't. In the background the homes, left to right, 22 Clark Lane, 20 Clark lane, and 15 Clark Lane showing the proximity to the homes. 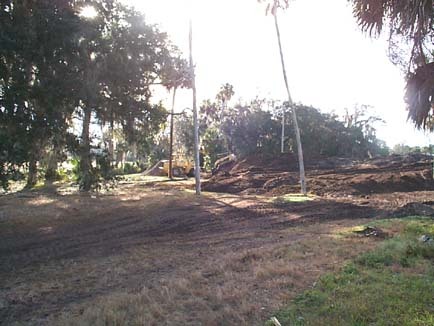 The weekend of January 18, 2009, the complete demolition of Palm Coast' First Child and Neighborhood Park; sadly a Park 164 families once enjoyed for decades this last Century is now gone, this Century. Last year we asked the Parks and Recreation person to restore it; we never had the courtesy of a reply back. 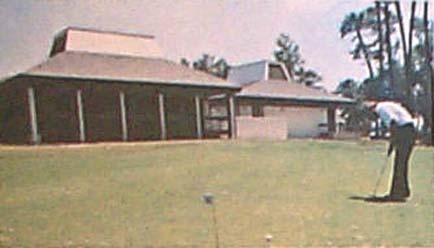 The specific location of the Palm Harbor Clubhouse on Cooper Lane which we were shown on the 'Companys' official Guided Tour. This first Child's and Neighborhood Park, to our knowledge was revitalized about two or three times since it was in use for so long. 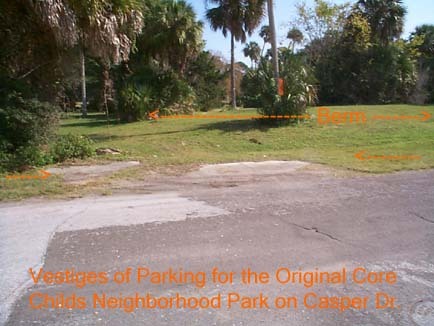 This is a current picture showing the vestiges of the ashphalted Parking and Bicycle Rack cemented area for this Park. Ashley's Great Grandmother wheelchair got stuck in the sand just in front of the parking area and Bicycle Rack area. This Picture shows there was a Berm added upon its last revitalization. On the other side of the berm were alot of built in Benches for Seating and Relaxation. In front of the seating were the Child's Playground Equipment. At various point there was additional park bench seating also. This newest revitalization included Basket Ball Hoops. It was the general consensus that the 'Designer' by adding this did not realize the proximity of Ann Tillard's home ( 30 Casper Drive ) and the other homes. This newest revitalization brought with it BOOM BOOM BOOM BOOM BOOM BOOM of the Basketballs. The BasketBall Hoops were removed; the rest remained intact. For some reason later on, the rest of the playground equipment was removed. Incredulous since we all paid a Premium Price and had enjoyed this Park for Decades. We don't know if this First Park was listed in the 'Agreement' with the Developer and the F.T. C. - Federal Trade Commission in/around 1974. We always were told this is 'Reserved Greenbelt Area' since the Developer wanted to keep the density at 2.5 per acre, ...'...less than in Beverly Hills...'. More Significantly this Park is the site of the birth of the First Organization in Palm Coast - The Palm Coast Civic Assocation. Quickly, the First Core of Homes approached completion. There was NO public area large enough for the 'Pioneers' to meet for 'town-talk'.as a Group. Consequently the ' Pioneers' choose this venue, the First Park, since that was all that existed at this time for the 'Town meetings'. It was convenient, was asphalted, and large enough for the 'Town Meetings'. As an aside, Colonel Lynn and Josephine Wickland, 22 Clark Lane, on the day of the meetings would raise a large American Flag at their home on their Large Flagpole, an indicator that this was 'Town Meeting' Day. Shortly thereafter, after seeing Colonel Wickland display his flag, the Emilians of 20 Clark Lane, the Malatinos of 18 Clark Lane, We, and Alisha Newton, of 15 Clark Lane started displaying Flags also. The meeting usually were on Sunday Afternoons before dinner and before it got dark. The Park was much larger then but there was only a few Park Bench es for seating. ( Orange letter 'B' above ). Colonel Wickland just prior to the 'Townmeetings' would stand in front of his home with his wife Josephine. He would *ring* his Town Crier Like Bell, his wife sometimes ringing a larger School Bell type bell which was affixed to the wooden post of the fence that surrounded their Swimming Pool. Colonel Wickland was a Stately Gentleman that smoked Cigars. His 'Conestoga' Ride was a powerful 'Silver Gray Toronado'. He would Ring the Bell and say...' Oyez...Oyez...Oyez....Bring a Chair...Bring a Chair...Everyone , Bring a Chair...Oyez ..Oyez...Oyez...'. They would also raise a large flag on their Flagpole. The Flag would also be raised on Federal Holidays but, also, on the days of the 'Town Meetings'. Most just looked UP and saw their Flag, knowing it was 'Town Meetings' Day. 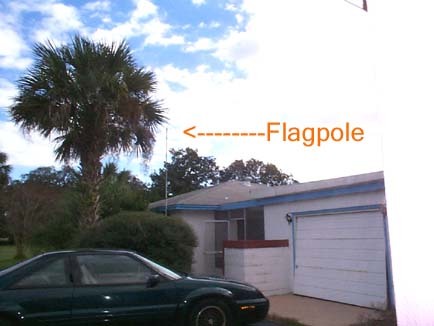 The tall Flagpole still exists today at 22 Clark Lane). The Clark Laners would collect their webbed lawnchairs and all start to walk towards this Park, lawnchair in hand. Pioneers from the other streets would walk to the Park at around the same time for the start of the 'Town -meeings' for their 'Town Talk'. The 'Town Talk' generally focused upon what the Developer did promise and the 'Pioneers' felt they didn't get. The Most common theme was the Town talk of a 'Grocery' Store and the Interstate exchange. Those that had Mercedes deisel had to go to Ormond to get fuel and make sure they didn't run out. More importantly, very early on, a constitution and by-laws were drawn up. 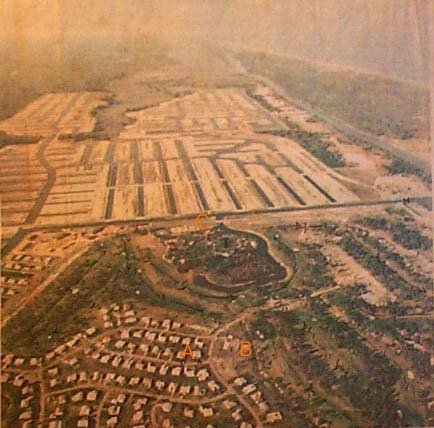 This was how the very first 'Town Meetings' started; the beginnings of the Palm Coast Civic Association. 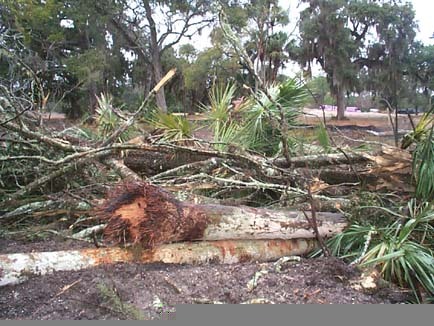 The Rear of the 19th Hole of Palm Coast Golf Course. Once it was completed the 'Pioneers' moved their Neighborhood Town Meetings from the 1st Park to this, this other location. It was welcomed since it had a roof, was screened in, had tables and 'chairs', and paddle fans. 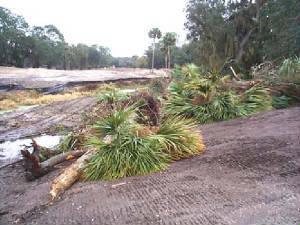 The Rear of the 19th Hole that was at Palm Coast Golf Club. The 'Pioneers' moved from the first 'Park' to this other location. The Dining Room here had a Roof! ...and Screens!...and Paddle Fans! for the 'Town Meetings'. 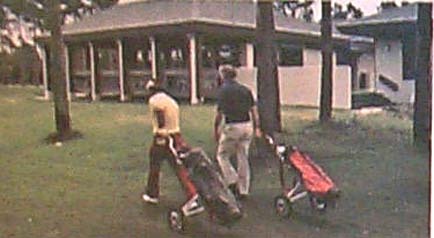 As the Population grew and people started using their cars to get to the Parking Lot at the 19th Hole; Colonel Wickland stopped being a 'Cryer' since most didn't walk to the 19th Hole anymore. Josephine Wickland passed on; and Colonel Wickland became interested in a nice school teacher from Bunnell. He spent most of his time in Bunnell. Consequently he asked if we wanted his American Flag and Bells. Colonel Wickland passed away just after becoming engaged to the lovely School Teacher. We will remain Stewards of the First Anerican Flags and Bells of Palm Coast along with so many jpegs, pictures, Bills of Sale, Deeds, and paper Ephemera; hoping for a Museum. 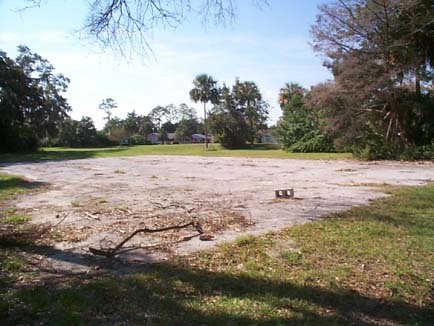 If this First Park is ever revitalized; we respectfully request it be themed appropriately and named 'Democracy Park' or 'Constitution Park' since that is where Palm Coasts' Civic Association roots began. We hope Ashley will understand if this happens.....if not, Ashleys Park. This was Colonels Lynn Wicklands' Flagpole location at his house at 22 Clark Lane. Keep in mind that there were few, if any trees early on ( pls. 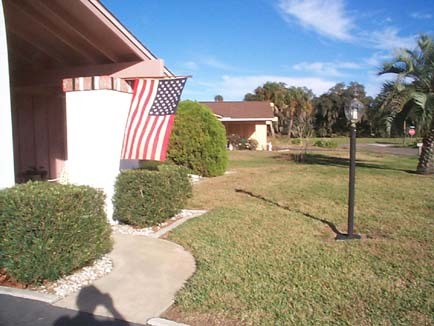 see 13 Clark Lane Page for the foundation pics showing minimal trees ) that would obstruct seeing his Flag Displayed. Colonel Lynn Wicklands' Flag that was displayed and signaled the day of the 'Town Meetings' at the First Park. The American Flags that Colonel Lynn and Josephine Wickland would hold as the Colonel held and rang the Town Crier Bell. Occasionally, Josphine would also ring the much larger 'School Bell'. 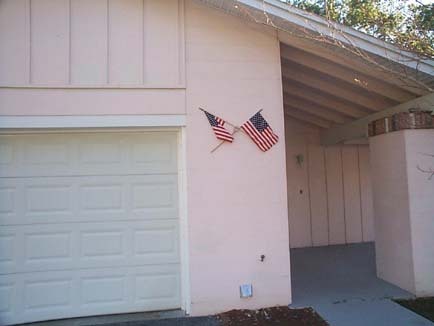 Their two hand held flags were shown here on 18 Clark Lane to show them and also show the location of their Flag Wall Bracket that Mr. Joseph and Rose Malatino, 18 Clark Lane, original 'Pioneers' also, used to display their flag on 'Town Meeting' day at the First Park. The First Site for 'Town Talk' of the 'Town Meetings'. 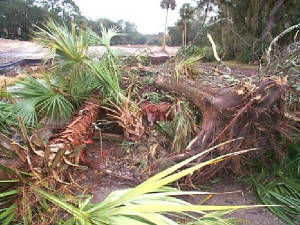 Oak Tree and Palm Loss at the First Park in Palm Coast Jan. 2009.